In 2013, Aileen Lee of Kleiner Perkins Caufield & Byers came up with the concept of the Unicorn Club, which includes US tech start-ups, spawned post tech wreck, that have reached public or private valuations in excess of US $1 billion. There are currently over 40 in the club. Brent Holliday and Garibaldi Capital Advisors conceived the idea of a club for Canadian tech companies that reached $1B CAD valuation and were started in 1999 or later. 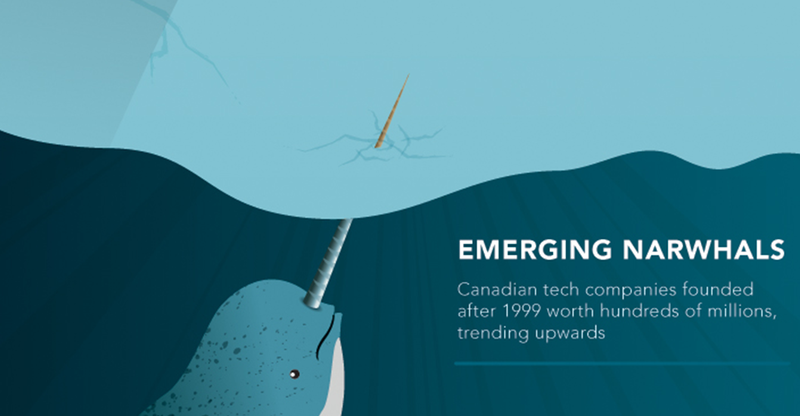 Witness the birth of the Narwhal Club, co-sponsored by our friends at http://www.visualcapitalist.com/.